Elizabeth Litzinger Allen, who holds a Ph.D. in organic chemistry, is a Technical Advisor at Rakoczy Molino Mazzochi Siwik LLP. Dr. Allen specializes in numerous areas of intellectual property law, and her background in medicinal and synthetic chemistry, as well as protein production and purification, allows her to make valuable contributions to many projects. 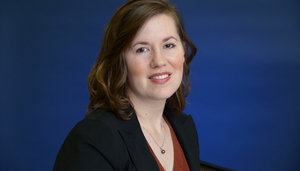 She provides technical litigation support, including substantive pre-trial research, in-depth analysis during litigation, and works with experts to develop theories for use in litigation. Similarly, she assists with preparation of opinions in the pharmaceutical, chemical, and related fields, including review and analysis of applicable prior art, execution of searches for relevant literature and patent materials, and helps construct sound scientific arguments. She also provides technical litigation support in a wide range of cases, including Hatch-Waxman pharmaceutical cases. She has also provided assistance during the prosecution of patents in the pharmaceutical, chemical and related fields. Dr. Allen has considerable experience in scientific literature research and analysis. She frequently performs searches for relevant art in the chemical, biological, and medical fields and is highly practiced using several search platforms including STN and Thomson Innovation. She, among other things, conducts specific and general chemical structure searches, including Markush structure searches, and high-level keyword searches. She is highly skilled at reviewing publications and analyzing critical scientific data for use in consultation and litigation. Prior to joining Rakoczy Molino Mazzochi Siwik LLP, Dr. Allen worked as a Technical Advisor at Leydig, Voit, and Meyer, Ltd.
Dr. Allen received a Bachelor of Science degree in Chemistry, with a double major in German, with University Honors from Carnegie Mellon University in 2000. She received a Ph.D. in Organic Chemistry from Northwestern University in 2005. Dr. Allen previously held a research position in the laboratory of Professor Bruce A. Armitage, investigating binding and aggregation patterns of cyanine dyes as templated by DNA. In the laboratory of Professor Richard B. Silverman, her research included synthesis, characterization, and in vitro testing of nitric oxide synthase inhibitors. Litzinger, E.A. ; Martasek, P.; Roman, L.J. ; Silverman, R.B. “Design, Synthesis, and Biological Testing of Potential Heme-Coordinating Nitric Oxide Synthase Inhibitors.” Bioorganic and Medicinal Chemistry. 2006, 14, 119-130. Erdal, E.P. ; Litzinger, E.A. ; Seo, J; Zhu, Y.; Ji, H.; Silverman, R.B. “Selective Neuronal Nitric Oxide Synthase Inhibitors.” Current Topics in Medicinal Chemistry 2005, 5, 603-624. Flinspach, M.L. ; Li, H.; Jamal, J.; Ying, W.; Huang, H.; Hah, J.-M.; Gomez-Vidal, J.A. ; Litzinger, E.A. ; Silverman, R.B. ; Poulos, T.L. “Structural Basis for Dipetide Amide Isoform-Selective Inhibition of Neuronal Nitric Oxide Synthase.” Nature Structure and Biology 2004, 11, 54-59. Garoff, R.A.; Litzinger, E.A. ; Connor, R.E. ; Fishman, I.; Armitage, B.A. “Helical Aggregation of Cyanine Dyes on DNA Templates: Effect of Dye Structure on Formation of Homo- and Heteroaggregates.” Langmuir 2002, 18, 6330-6337. Litzinger, E.A. ; Garoff, R.; Armitage, B.A. “Effect of Chromophore Structure on Assembly of Helical Cyanine dye Aggregates on DNA Templates.” Book of Abstracts, 217th ACS National Meeting, Anaheim, CA, March 21-25, 1999.